The E-310 short-range unmanned air system is developed by PIT-RADWAR and Eurotech. Image courtesy of PIT-RADWAR S.A. The unmanned air vehicle features a V-tail design. Image courtesy of PIT-RADWAR S.A. The E-310 UAS has a service ceiling of 5,000m. Image courtesy of PIT-RADWAR S.A. The E-310 was exhibited in the MSPO international defence exhibition in 2014. Image courtesy of PIT-RADWAR S.A.
E-310 is a low-to-medium altitude, short-range unmanned air system (UAS) designed and manufactured by Eurotech in collaboration with Pit-Radwar, which is owned by Polish Armaments Group (PGZ). The UAS is intended primarily for military missions such as intelligence, surveillance and reconnaissance (ISR), and also can be configured for civil applications. Pit-Radwar developed the control station and communications systems for the E-310, while Eurotech was responsible for the aerial platform. Polish research and development company SeCom supplied video / telemetry data links for the UAS. A prototype of the E-310 aircraft system was exhibited during the Paris Air Show 2013 in Le Bourget, France and MSPO 2013 international defence industry exhibition held in Kielce, Poland. A demonstration flight of the E-310 took place at the Central Polish Air Force Range in Ustka in June 2014. The UAS was proposed for the Polish Armed Forces in July 2015. It also participated in the MSPO 2015 exhibition. communications and data transmission systems. The UAV has a length of approximately 3m, a height of 0.7m and a wing span of 5.4m. Its airframe is made of composite materials. The middle section features two long, fixed wings with winglets, providing improved aerodynamic efficiency. The tail section has two vertical fins, mounted in a V shape. With a maximum take-off weight of 80kg, the drone can carry payloads of up to 20kg. It requires low operational costs and offers high mobility. The modular, open-architecture design enables integration of different mission systems. The E-310 drone is launched into the air using catapult or pneumatic launcher, towed by a wheeled vehicle and is recovered by parachute or retracted landing skid. It has the ability to take-off and land on unprepared fields. It can perform highly autonomous operations, from take-off to landing using pre-defined waypoints. 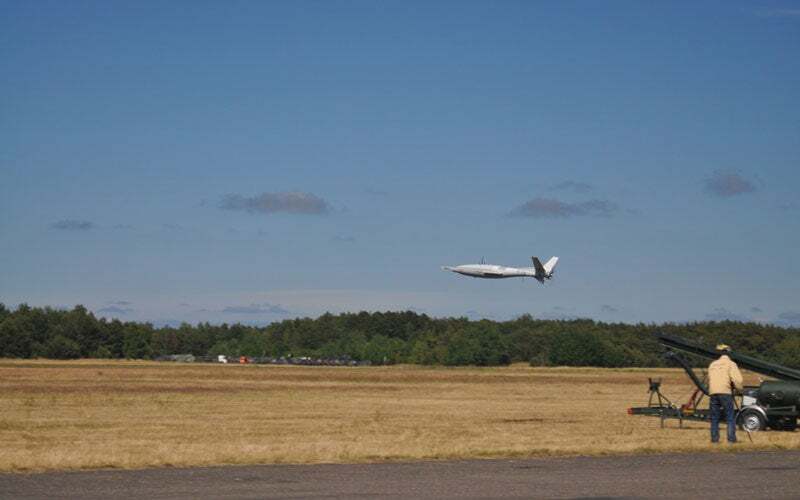 A data link in the nose facilitates secure communication between the unmanned aircraft and its mission control station. The UAV can carry a variety of mission-specific sensors in a modular payload pod, placed underneath the nose. The on-board electro-optical (EO) / infrared (IR) imaging sensors detect and track objects in both day and night lighting conditions. "The UAS is intended primarily for military missions such as intelligence, surveillance and reconnaissance (ISR), and also can be configured for civil applications." The payload pod also incorporates electronic intelligence (ELINT), a CCD camera, advanced reconnaissance and observation sensors, synthetic aperture radar (SAR), night vision sensor, laser rangefinder, and other specialised surveillance equipment. The UAV can be remotely controlled by its operator from the mobile ground control station. The payload data is down-linked in real time and processed at the control station, then commands are sent to the UAV over the data link. The control station is carried on a medium-capacity vehicle, which is also used for towing the launch trailer. Powered by an internal combustion diesel engine / hybrid electric motor, the E-310 UAV can fly at speeds ranging between 120km/h and 160km/h. The engine drives a three-bladed propeller, placed in pusher configuration. The drone can reach up to an altitude of 5,000m and has a range of 150km. It is easy to operate and has the ability to perform missions in hard-to-reach areas. It can stay afloat for up to 12 hours. Amphenol Fiber Systems International (AFSI) is a fiber company specialising in the manufacture of fiber optic connectivity products and systems.